and a sprinkle of gold and a whole lot of ambiance. 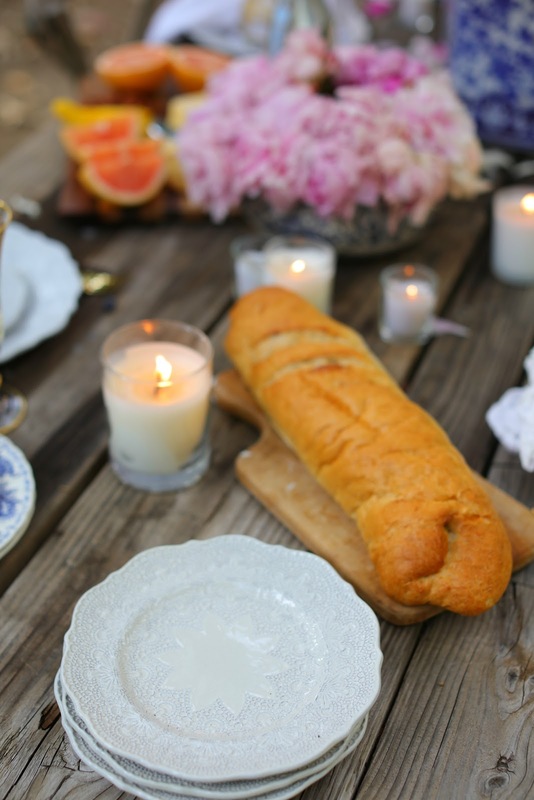 A winning recipe for a summer table for friends for and family to enjoy in my book. 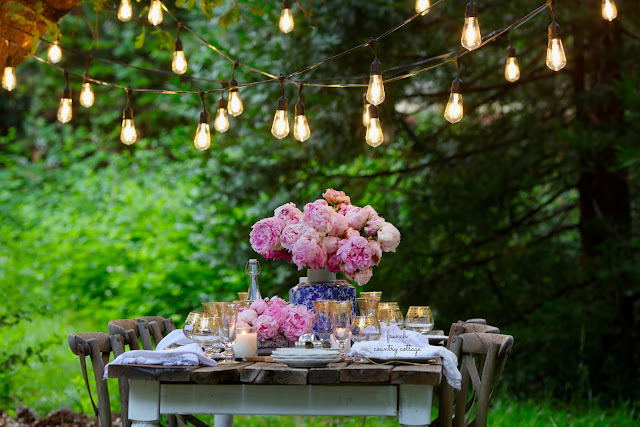 And with warm evenings on the calendar ahead- now is the perfect time to gather ideas and tips to get ready for summer parties and get togethers. 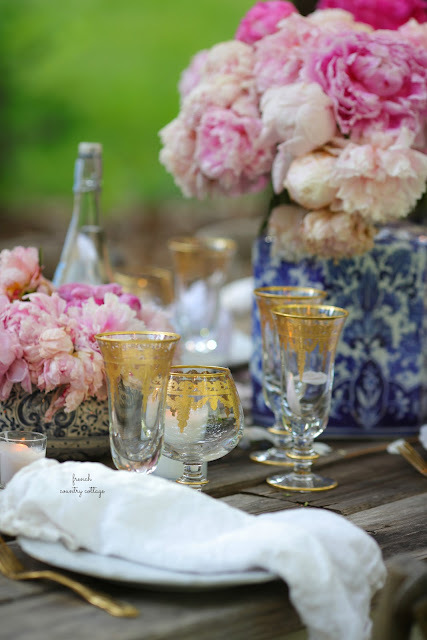 And something I am always asked is how do those layers come together on the table to create a charming setting. 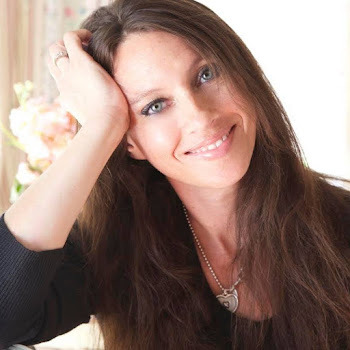 And today- sharing a few simple tips with you. I always start with flowers when setting a table. The color, style, height, fullness, etc all dictate the 'mood' of the table and what direction it goes in. 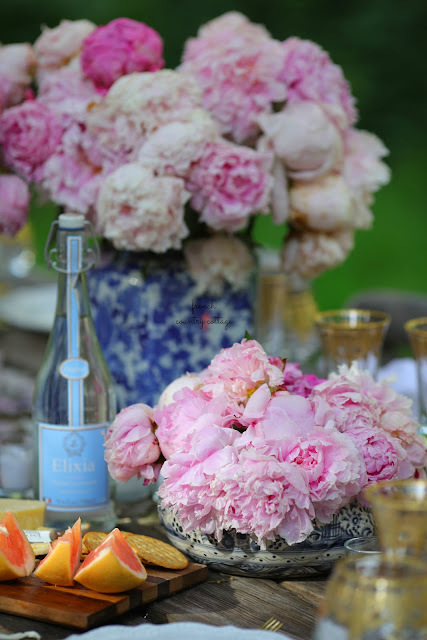 This table is blush peonies and blue and white- which inspires a fresh, summery vibe. 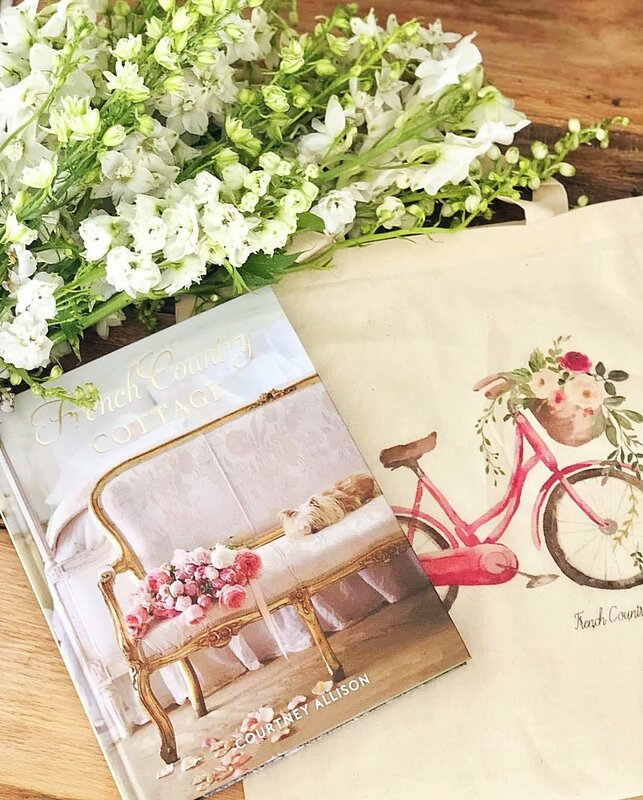 Style tip: Shop the grocery store flowers, your garden and even your daily walk for summery wildflowers blooms for a table. These blue and white containers are ginger jars which I had set aside from the patio styling from a few years back. By taking the tops off- they were perfect smaller vases. Style Tip: Use blue and white pots for flowers and even other containers that may not hold water by adding a vase, glass or even plastic liner to them and filling with water. If you have a long table like this one - march those flowers right down the center. One arrangement can be enough if it is large- along with several small ones tucked the rest of the way. Or you can go with big and beautiful on repeat. Style Tip: Think of 3's or 5's for the perfect number for this table. 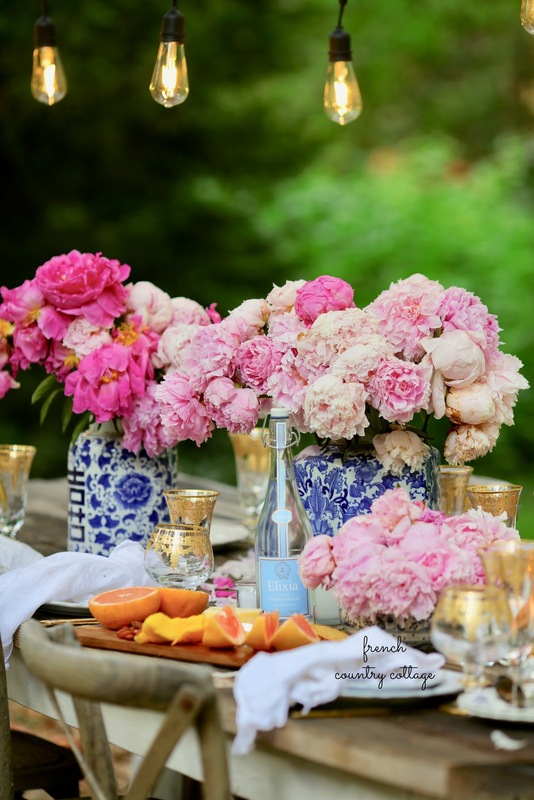 One of the perfect ways to incorporate several arrangements on the table is to think high and low for more interest. For this table, I used 2 ginger jars and a small blue and white bowl filled with clipped flowers for interest and extra charm. 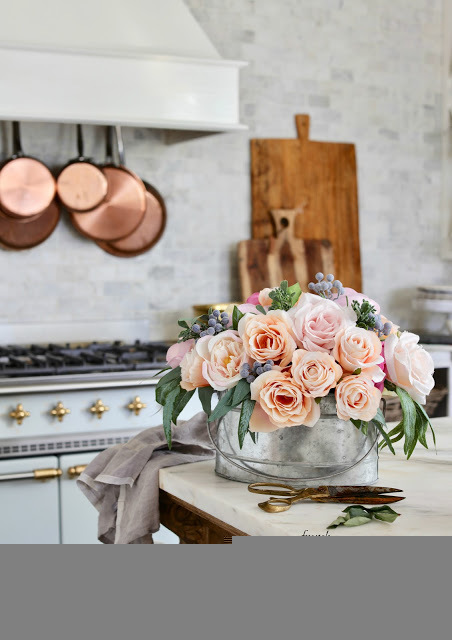 Style tip: Take those bent or broken flower stems and clip them short for a dainty arrangement. 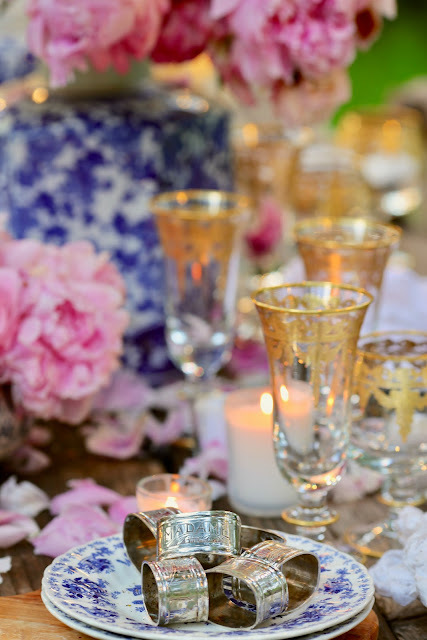 The perfect place settings don't have to be matchy matchy- or perfect for that matter. You can mix and match vintage or vintage and new if you like. Or you can go with favorites that are always on repeat. These dishes from Arte Italica are incredibly detailed and delight guests every time. Style tip: Mismatched or unified- layer and layer those plates for even more details. Pair those dishes with gold for the Midas touch. 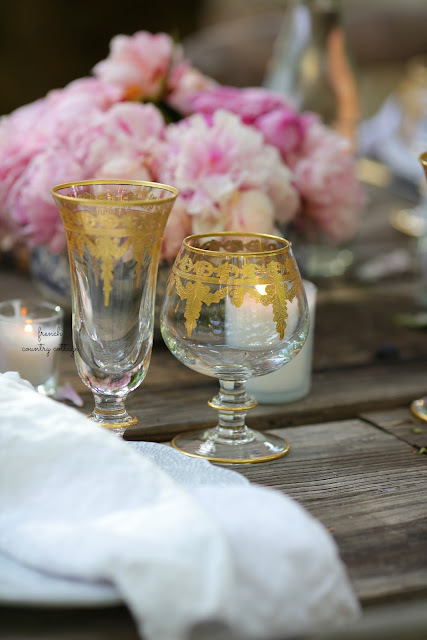 Gold flatware and the most incredible detailed gold glasses create a bit of drama and elegance on the table. Style tip: Bring out extra glasses for the place settings for even more mood- the candles will flicker and reflect that gold. I used Arte Italica Vetro Gold champagne flutes and brandy glasses for this setting. March those candles down the center of the table- the more the merrier. Candles bring a whole lot of charm packed into a little flicker and they are perfect lighting for warming up the table top. 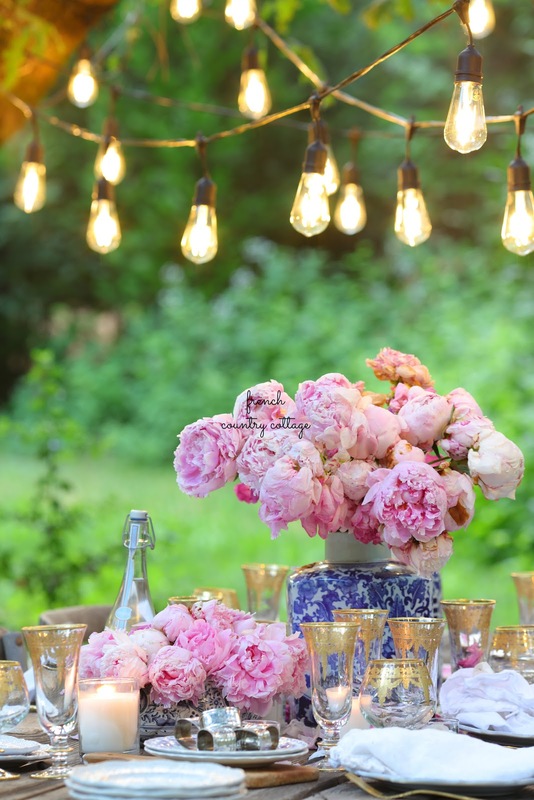 Style tip: Tuck them in between the flowers, scatter near the place settings and vary the sizes. Some larger, some smaller, some votives and tiny tea light sizes. The varying effect will add to the ambiance. Something that is often overlooked- the overall ambiance of the setting outdoors. Often times people pay attention to the table top- and that is all- when it comes to creating that 'mood'. These are from Balsam Hill- and you will be seeing much more of them soon. Style Tip: Think beyond the table for the most amount of oomph. String lights in tree branches, set lanterns on the ground, tuck candles into pea gravel (just remember safety). Bring in stacks of extra dishes- dessert dishes, breadboards with nibbles, something vintage for interest. 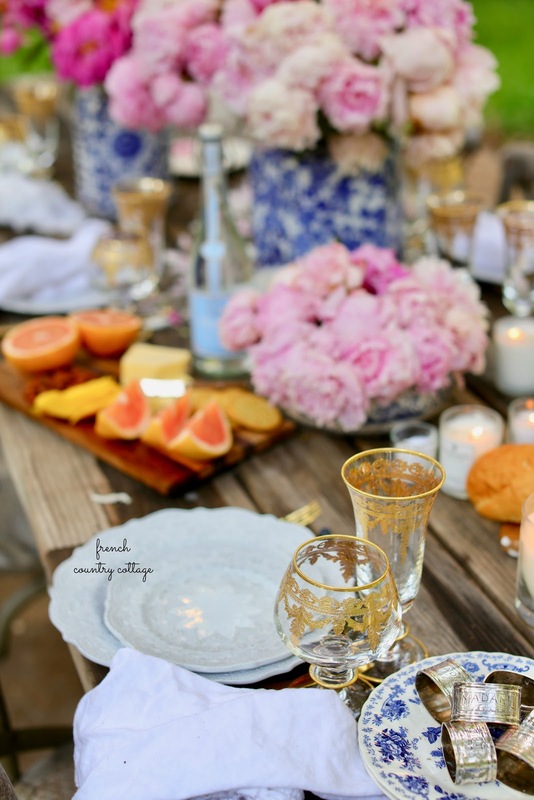 For this table, a stack of vintage silver napkin rings are gathered on a plate to keep things tidy; A breadboard is filled with slices of cheese, nuts and fruit waiting to be enjoyed by guests while waiting for food; and extra plates stacked up create a 'messy' charm and are useful for not mixing flavors on the main plate. 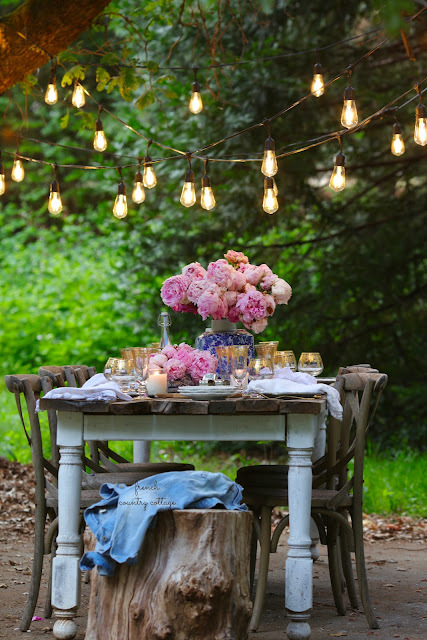 Style tip: Even things that are part of the meal can be beautiful and add to the ambiance. A breadboard with delicious and beautiful nibbles is perfect. Of course, don't forget the rest of the ambiance with the music. Something that is not too loud and not too soft, not too busy and not inviting guests to sleep- choose a station and set up bluetooth speakers for echoing the sounds. 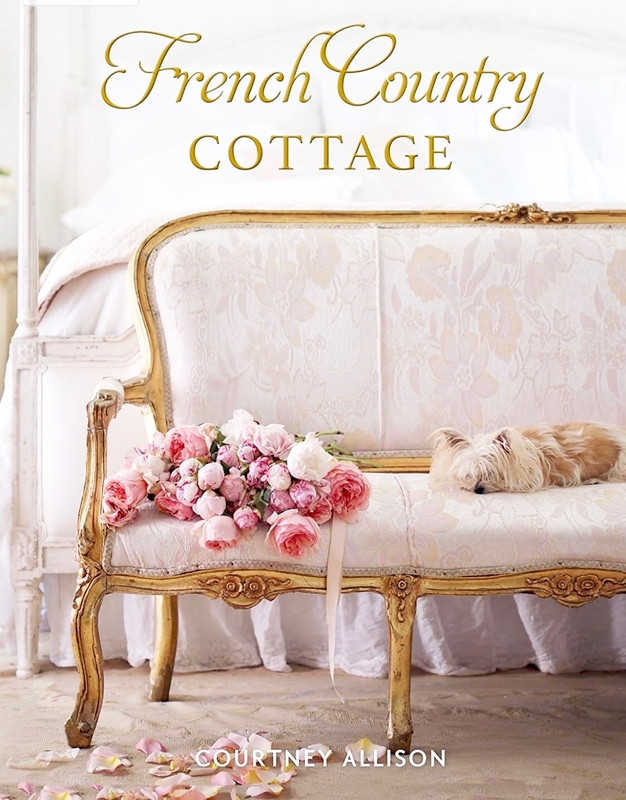 Between the music and the candles and twinkle lights- the ambiance will be incredible. And add interesting conversations with your guests and delicious food- and you have a successful and memorable dinner party. Style tip: Favorite tunes for summer dinners- Italian cafe music, coffee house music, etc. Think of the food theme of your party- and search for a station that will play a blend of favorites. And for those who are wondering... yes, we have raked the leaves up since fall... BUT- with Balsam Hill coming for a 'fall' photo shoot in May- we left a pile of leaves for them to use next to the patio. And this table was styled the same week they were here scattering those leaves once again. I am thinking I should get a head start of autumn posts before raking them up and moving them again. *some affiliate link & I collaborated with Arte Italica to show you how I style some of my favorite pieces for summer. Oh wow, this is really so beautiful. The table is so pretty, I envy you the glasses, the silver napkin rings. It's beautiful under the lights. I could make a meal with only the bread. Your flowers are always just the right color. time well spent for a lovely evening. Hi there, what is the height of the ginger jars you used?